In The Star, the latest production from Sony Pictures Animation (Cloudy with a Chance of Meatballs, Arthur Christmas), we are introduced to a sheep named Ruth (voiced by SNL's Aidy Bryant) who has essentially defected from her flock because of the titular star, an unusually bright heavenly body that showed up around the same time the angel Gabriel appeared to Mary in Nazareth to inform her she was highly favored and would be carrying and raising the son of God. Ruth can't help but to feel the appearance of this star is significant in a way she can't describe or pinpoint, but rather it is something she inherently feels she can't ignore. Ruth follows this feeling even when the rest of her flock continue to travel with their herd. This more or less makes Ruth the greatest embodiment of what true, genuine faith looks like in The Star and while this is a movie based around the nativity story in a way children might be able to more easily access it, this is the greatest virtue it has to offer. Admittedly, the idea of going against the grain, rebelling against the norm for the sake of something you truly believe in is something of a common theme in children's entertainment so as to promote individuality (this is the arc played by our main character, a donkey named Bo (Steven Yeun), actually), but there is a difference in doing something out of desire or drive for the satisfaction of your own life and being able to give of your own life for a purpose you believe is greater than yourself and that is what comes to be the most evident about Ruth in The Star. Ruth exemplifies a selflessness in service of this unwavering faith in something that struck her upon seeing that star start shining in the sky; a feeling she can't explain other than to describe the fact it stirs something inside of her. But faith has always been about not having the right answers, but rather a feeling. A hunch, really. It's a hunch that there is something bigger connecting it all and connecting us all together. For Ruth, and eventually Bo and several other animals that bear witness to the events that take place in The Star that feeling, that hunch, turns out to be God. This might lead you to believe that Ruth should in fact be the lead of this new-found perspective on the nativity story, but that would be incorrect. For, despite illustrating that key difference in doing something out of desire for yourself and being able to give of yourself for a purpose greater than yourself The Star instead feels it necessary to place the aforementioned Bo at the head of the story. Yeun's Bo is a small but brave donkey who yearns for a life beyond his daily grind at the village mill where he works with an older donkey (Kris Kristofferson) that has accepted his lot in life. After attempting a break-out with his comic sidekick, a pigeon named Dave (Keegan-Michael Key), Bo has lost all hope of ever achieving his dream of joining the royal caravan. One day, with the help of the older donkey, Bo finds the courage to break free, but doesn't manage to get very far and injures his ankle in the process. Fleeing the miller who owned him Bo ends up finding refuge at the house of an unsuspecting, recently married couple named Mary (Gina Rodriguez) and Joseph (Zachary Levi). I'm sure one can see where things are going from here given by this point the film has already glazed over the angel Gabriel appearing to Mary and breaking the news to her while, on the heels of Bo arriving after their wedding reception of sorts, Mary then has to break the news to Joseph that she's pregnant with God's baby and that he has requested she and Joseph raise it together. Boy, writing this down makes it seem all the more bizarre, but the movie plays it fairly straight with Joseph taking the news in stride and getting a visit from his own angel in order to put his questions and unrest at ease, but mainly so the movie doesn't have to deal with anything nearing complex emotions. Instead of focusing too much on Bo's arc of becoming selfless to the point of caring for Mary and Joseph without question the film instead adds the subplot of the evil King Herod (Christopher Plummer) manipulating the three Wiseman and more notably, their camels, so that they can sell more toys while giving Bo someone to combat against. These three "wisecracking" camels include Deborah (Oprah Winfrey), Cyrus (Tyler Perry), and Felix (Tracy Morgan) who sniff out Herod's plan as Bo is forced to face off against a faceless soldier and his dogs, Thaddeus (Ving Rhames) and Rufus (Gabriel Iglesias), to save what would ultimately come to be the first Christmas. Mary (Gina Rodriguez), Joseph (Zachary Levi), and all of their visitors celebrate the first Christmas in The Star. © CTMG Inc, All Rights Reserved. Sure, one could think of The Star as nothing more than an opportunity for Sony to capitalize on a certain demographic of people during a certain time of year so as to guarantee a fair amount of profit off an investment that feels as if it was always on the back burner given The Star, with a price tag of $20 million, took little to no actual risk in financing the and even less when executing the artistic and creative side of the endeavor. It would be easy to think in these terms because they are undoubtedly accurate to a certain extent, but as someone who likes to at least imagine themselves as something of a creative person I find it hard to believe that those working on this project didn’t eventually find themselves invested in trying to make this as good the request they’d been met with would allow it to be. This gives way to the fact that The Star, which initially looks and feels like something that has sat on your church’s library shelf for a long time or is that movie that’s always in the $5 bin at Walmart isn’t as bad as everything about it would lead you to believe. That isn’t to say the movie is in any form of fashion something that radiates originality or depth beyond its parameters, but The Star does what it was made to do well enough so as to be pleasing without being completely pointless. I liked Ruth and her energy and willingness to help as well as her bravery in the face of nervousness and how it rubbed off on both Bo and Dave who, admittedly, form a fairly good comic team that you want to root for in terms of them accomplishing their goals and saving the day. Yeah, the movie kind of loses its way when it comes to the lesson it should really have honed in on if it wanted to balance both a Christian-based crowd and a broader audience while at the same time attempting to provide any kind of substance, but that it gets from one point to next in a cohesive and enjoyable fashion doesn't go without saying. 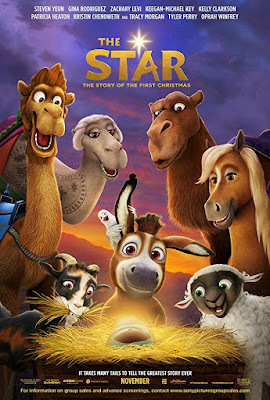 On the most vital of points most parents will be concerned with, The Star succeeds as it integrates the animals into the story well and gets the message across clear enough that the little ones will appreciate the "comedy" as well as the moral it's teaching. It’s simplified, no doubt, and there are small things added here and there that may irritate some people-for instance, I’ve never heard of dogs being at the birth of Christ-but as far as the heart of the story it’s faithful where it counts.